To compile the history of this Parish and confine it to a page is a daunting task, for the fellowship of this community can not be contained on the written page -- it cannot be presented with justice to those who have never set foot within this community. The story of St. Louis Parish is intertwined into our own personal stories -- it intermingles in the day-to-day joys, celebrations, trials and tribulations of its Parishioners, and it all began in 1926. September 7, 1926, Fr. Victor J. Renaud received the appointment, from Bishop Michael Gallagher, to organize, build and preside over a new Parish in Mt. Clemens. Boundaries of the new parish were set as east of Gratiot to Lake St. Clair between Fifteen Mile Road and Hall Road, and with those parameters, 350 families made up this infant congregation. On September 13, 1926, the heirs of Louis and Mathilda Charbeneau came forward to donate four-and-a-half acres of family land. Fr. Renaud took into consideration the generous gift from the Charbeneaus and chose the French Saint, King Louis IX, as the churches patron in honor of the late Louis Charbeneau. Fr. Renaud purchased a little, white school building from Trinity Lutheran Parish for $500. A month of rainy weather delayed the moving of the building to the new property, but the school building finally arrived October 14, 1926. Carpentry work began and male parishioners donated their weekends to the work at hand, but the work was not progressing fast enough, so the men decided to volunteer their evenings as well. The evening of November third set in with a large crowd of workers gathered at the church. In that one night, flooring, 45-foot-by-30-foot, was laid, the woodwork was cleansed and varnished and the electrical fixtures were installed. As they toiled great into the chilly Autumn night, the women of the parish arrived with sandwiches and hot pots of coffee to refresh the workers.The first services were held in the new church, Sunday, November 7,1926 — a building assembled by those who sat in the body of the new St. Louis Catholic Church. On July 4th, 1927 ground was broken for the church/school during an all day picnic and carnival, which was held on the parish grounds. During the afternoon of September 25, 1927, 2000 people arrived to participate in the ceremonies as the cornerstone of the church/school was laid. 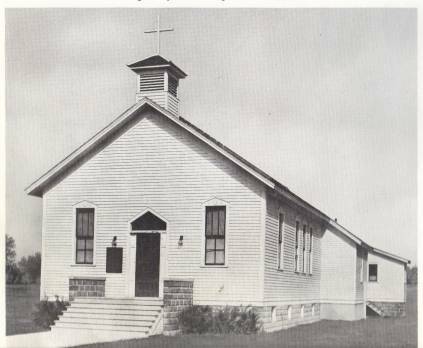 Mass was celebrated for the first time in the new Church/ School (now called the Social Hall) on Easter Sunday 1928 and the building was formally dedicated on July 25 by Bishop Gallagher. This new building cost $125,000 to erect and held six classroom, an office, the church and a music room. On September 10 the school opened it doors to 315 students. In June of 1929, twenty-six students graduated from the eighth grade. Finally, it became imperative to build a new rectory and ground was broken on September 18, 1929. In the spring of 1930 the beautiful new rectory, at a cost of $23,000 was ready for Fr. Renaud. Fr. Renaud toiled everyday to make his parish stronger and continued to do so until 1936 when he was transferred to St. Mary, Anchorville. 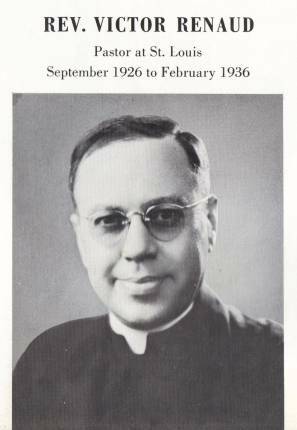 Father Renaud passed away October 25, 1958. Father Harold Rosebrook took over where Fr. Renaud had left off. In June of 1942, Fr. Rosebrook was transferred to St. Leo’s in Detroit, and so St. Louis bade farewell to its second priest. Fr. Rosebrook passed away October 19, 1977. 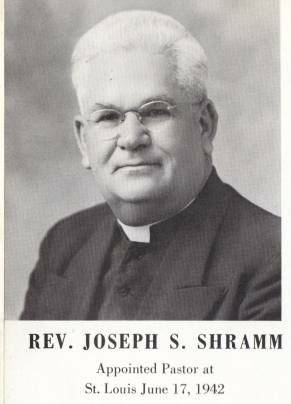 Father Joseph Schramm was Fr. Rosebrook’s successor, and he came to St. Louis from Our Lady of Victory, Northville. In the spring of 1944, Michigan’s first Prince of the Church, Edward Cardinal Mooney, administered Confirmation to the children of St. Louis. This marked the first time such a prelate had ever visited Mt. Clemens. In 1950, ground was broken for six new classrooms, to be built at the north end of the school, and a new convent, to be built on the corner of Charbeneau and Crocker Blvd. Both structures were completed in 1951. Shortly after these additions were completed, another unit was erected at the south end of the School which provided six more class rooms, an office and a large assembly room. In September of the same year, St. Louis High School was added to the elementary program, beginning with the ninth grade and adding another level every year. In 1954 all 12 levels were up and running. Overcrowded Sunday Masses led to a new fund raising campaign to pay for the much needed church. Four-hundred, fifty-thousand dollars would be needed to build the new church, which would occupy the site located between the rectory and the convent. Ground for the church was broken on September 20, 1957 and on June 11 the next year, Bishop Hubert Maino laid the cornerstone with the assistance of Frs. Schramm, Edward DeKeyser and Thaddeus Rzeznik. The church was completed in time for the Christmas season, and the first mass was celebrated December 7, 1958. 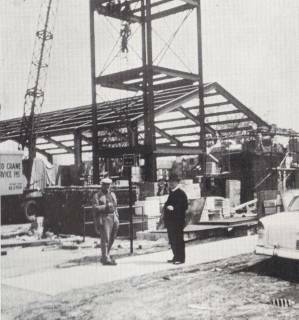 The cornerstone for the high school was laid November of 1963 and the unit was dedicated to John F. Kennedy. The school was completed and ready for opening in 1964 in the midst of the Vietnam War. June 15, 1966 Fr. Schramm retired after forty years of devotion to the Archdiocese and 24 years of furthering Fr. Renaud's dreams for this now thriving parish. Fr. Schramm left St. Louis debt free, with 850 students in the grade school and 340 in the high school. Fr. Schramm entered eternal life June 20, 1974. Father Joseph F. Ryder arrived on the steps of St. Louis Parish in 1966 from his position as founder of St. Alexander, Farmington. Fr. Ryder was quick to his work, as surging parish activities and administrative responsibilities, instituted by Vatican II changes, increased his staff and space needs. Late in 1966, renovation of the rectory began, which added two more offices and a reception room to the first floor, as well as, increasing second floor accommodations. It was decided March 23, 1968 by the School Board that the High School would be phased out beginning with the ninth grade, commencing with the 1969 - 1970 fall semester. On April 27, 1969, Parish Council decided to close St. Louis High School at the end of the next school year. Fr. Ryder left our parish in June of 1970, after only four years of service, and Father David E. Weisner took the helm with Father Robert J. Poledink as assistant pastor. The two priests found themselves in the midst of a large hardship within the community. Financial strain made the decision to close down the grade school inevitable, and although the pressure from parents was immensely overflowing to keep the school up and running, the grade school was closed June 8, 1971. In 1973 the convent was deemed to large for use and was leased out for other purposes. The small house on Ormsby, across from the School, which was once used as the rectory, a home economics center and as the home for the janitor and then the housekeeper, was renovated to accommodate the sisters. The new convent was completed in the spring of 1974. Fr. Dave’s first eight years passed by and the disappointment over the closing of the grade school subsided, but it was time for another change. At the request of Fr. Dave and the Worship Commission, a committee was formed in 1978 to look into possible changes to our worship space. This important idea of restructuring the church was approached with great care. In September of 1980, permission for the renovation was received from Archdiocesan officials, but it wasn’t until April of 1981 that the actual renovation began. Anything salvageable was saved, if needed, otherwise it was put up for sale. The pews were sold in lue of the arrival of the new interlocking chairs. The Sanctuary was converted into the Eucharistic Chapel, and the Altar was moved to the south wall of the church. New lighting and sound systems were installed, as well as, carpeting throughout the entire church body. In October of 1981, construction was drawing to a close as dedication of the space was scheduled for the next month. Archbishop Szoka arrived on November 7, 1981 to dedicate the worship area. Though a few things had yet to be completed, the baptistery (which was to be assembled from the marble from the sanctuary and the side altars), installation of the new organ and the stations of the cross, the ceremony took place with a full house. 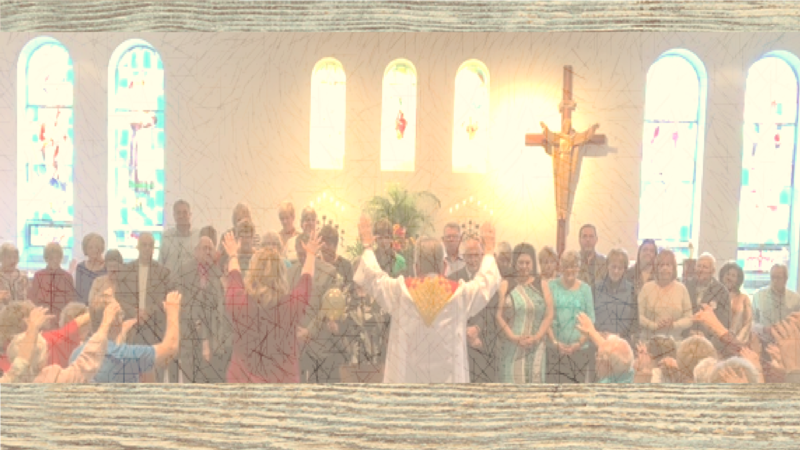 With the new arrangement of the church, the Parishioners’ fellowship grew as they became aware of one another and were drawn into active participation in the Liturgy. In July in 1985 Father Dave Weisner bid St. Louis farewell and left for Our Lady of Good Council in Detroit. Fr. Dave passed away September 27, 1998. Father Pasquale LoGrasso came to St. Louis in 1985 from St. Louise, and was saddened to watch us tear down our White Hall. During the late eighties, the old church/gymnasium was renovated, to what is now known as the Social Hall, to hold the activities that use to be held in the White Hall. In 2000, because a smaller amount of Parishioners were attending weekend Masses, St. Louis had to cut back to three Masses. It was also decided in 2000 that the stained glass windows needed repair and like so many other times St. Louis has needed to raise funds, the people of the parish donated much of the money needed to handle the expense. Father Anthony Sulkowski, left his position at St. Mary’s in Monroe and came to minister to us during the summer of 2002. In 2007 Fr. Sulkowski was called to a new assignment at St. Basil the Great. Our current pastor, Fr. Larry Pettke came to us from St. Bede's in Southfield, whose doors closed in 20? ?, and with him came a love of God so great, it is catchy. He also brought a surrplus of jokes that can make you groan and laugh when you don't even want to smile. Larry is the catalyst that has made the kinship we have always felt for our fellow parishioner bubble to the surface, causing it to spill over into our workdays -- our school days -- our neighborhoods. He has instilled in us a great desire to spread the Good News with understanding, compassion and an open heart. In retrospect of the past years, we’ve watched as some have left this Parish in search of spiritual nourishment at other parishes. There are those who’ve tearfully moved away from us for the sake of employment or family. Then there are those Parishioners who have stood by this community we’ve built no matter what, and it is because of these people that we are still an active, beautiful parish. In over 80 years of existence, St. Louis Parish has planted and pruned when necessary. Its people have learned to cope through the tender cut-backs and the overwhelming tenacious growth, and they have learned the reality that no achievement can be perfect unless it constantly changes to fit new needs. Continued personal sacrifice and painful effort have been required to build and sustain our common unity, for it is through the growth that we have met each other but through the trials that we have come to know each other. We have come to the true love of Christ together — as a fellowship — as the family of God.